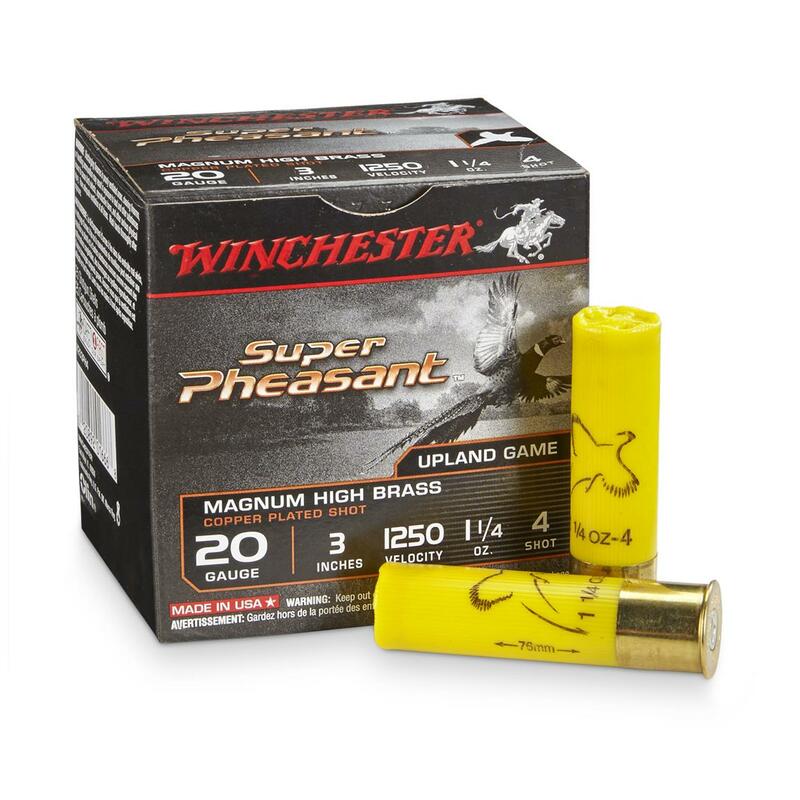 25 rounds Winchester® Super-X® Super Pheasant Copper Plated Shotshells: a true "beast of birdin'!" Super-X® Pheasant Shot packs the right combination of heavy charges and outstanding muzzle velocity... the result is a load that hits hard and penetrates deep, bringing down birds from range. For shot-after-shot power, long-range reliability, and nice tight patterns, Super-X is a super-star! 25 rds. Winchester 20 Gauge 3 1 1/4 oz. Super-X Super Pheasant Copper Plated Shotshells is rated 4.9 out of 5 by 8. Rated 5 out of 5 by HuntFish55 from Go To Pheasant Load I have been on several hunts the past two years and I found my new go-to load. This load seems to pack the punch to knock the birds out of the sky but also let me reach out at good distance. Price is right as well!! Rated 4 out of 5 by Blackjack from Definitely Puts Rabbits Down I just got back from a week long Pheasant hunting trip in Kansas. I shot this ammo almost exclusively. I did have one Failure to Feed issue but i am not 10% sure if that was the ammo or gun (it was very dusty there). I shot more rabbits than anything, and where rabbits die easy anyways this shot made short work of them. As a kind of added bonus the copper plated shot is easier to see when cleaning game. Rated 5 out of 5 by Old Virginia from Great 20 gauge rabbit load When I turned 70 yrs old, both myself and my 12 gauge gained a lot of weight - I switched to a 20 gauge and the weight reduction was significant - of course I selected a 20 gauge with a 3 inch chamber to equal the payload of the 12 gauge - these shells are real bunny busters. The 1 1/4 ounce load gets the job done with ease. Rated 5 out of 5 by Old Virginia from Great 20 gauge rabbit load This 3 inch 20 gauge load packs 1 1/4 ounces of # 6 shot - that's right, a 20 gauge shell with a 12 gauge payload. This load will reach out and roll those bunnies like a freight train. Expensive but well worth the money. They are also available in # 5 & # 4 shot. Rated 5 out of 5 by FredsFineFowl from When you need to STOP THEM IN THEIR TRACKS We have free range chickens and need a rapid response when predators show up. We also need to take out woodchucks from 100+ feet away.These 20 gauge shells/loads pack a wallop and keep a tighter pattern at greater distances.Had a fox rushing in on a chicken, had a mouth full of feathers, dropped him in his tracks with a single shot. These are the loads I should have been using all these years.With other loads, I would shoot a woodchuck and it would run to its hole, what we called "self-burying chucks". I didn't like the idea that it took so long for them to die. With these Super-X Super Pheasant Copper Plated Shotshells, the chuck just plunks down on the spot with no twitching, crawling, or flipping around. It's a complete shutdown kill. So long as they make these, I won't be buying any other load. As near perfect as I've ever used. Cuts right into small brush and does the job... one round, one body.I absolutely endorse them! Rated 5 out of 5 by Uncle Doug from Excellent Ammunition Very potent 20 ga. load. Patterns are great and the knockdown power is as good as it gets with a load of #4 shot. Rated 5 out of 5 by ALLEN from Great ammo. Great price. Excellent service. Rated 5 out of 5 by LONNIE from The only thing wrong with these shells was last season the dogs never had to chase any downed Rosters. The birds were where they fell. We never lost a one, 50 yrs + hunting pheasants these shells are GREAT, we never chased or lost a downed bird. I have always hated to down and loose any birds. They are worth the extra price. 25 rounds Remington 3" HyperSonic Steel 1 1/4-oz. Loads that have put meals on tables for generations!